$1.00 Stamps in MUH singles, blocks and sheets (1,900). Face Value $1,900.00. $1.00 Postage Stamp Combinations in MUH singles, blocks and sheets x 850. (90¢ Stamps x 850 + 10¢ x 850). Face Value $850.00. Accumulation of MUH Decimal issues. Face Value $443.90. Accumulation of MUH Decimal issues. Face Value $4,218.00. Accumulation of MUH Decimal issues from 1c to $5.00 values including range of Frama label issues. Face Value $1,281.00. Accumulation of MUH Decimal issues. Face Value $652.00. Also range of FDC's and Postal Stationary from 1980 to 1988, some with toning blemishes. Selection of stamps from 1977 to 1984, mostly in full or part sheets. Face Value $598.50. Accumulation of MUH Decimal issues. Face Value $327.00. Some issues hinged. Also small range of official unaddressed FDC's. Accumulation of MUH Decimal issues. Face Value $455.00. Also range of official unaddressed FDC's and PSE's from 1977 to 1987, plus small accumulation of Australia and Foreign used on and off paper. Also Australia 1979 uncirculated coin set. Accumulation of MUH stamps in sheets, blocks and singles including numerous booklets. Face Value $2,997.00. $2.00 Postage Stamp Combinations, mostly in MUH full sheets x 700. ($1.05 Stamps x 700 + 95¢ x 700). Face Value $1,400.00. Collection of MUH Decimal issues from 1966 to 1988 in Safe Hingeless album. Face Value $284.00. Selection of MUH International stamps. Face Value $430.00. Accumulation of MUH Decimal issues. Face Value $1,178.00. $1.00 Postage Stamp Combinations in singles, strips, blocks and sheets x 2,400. (45¢ Stamps x 2,400 + 33¢ x 2,400 + 22c x 2,400). Face Value $2,400.00. Collection of MUH Decimal issues from 1968 to 2003 in Seven Seas Hingeless pages from 1966 to 2006, in 3 binders with slipcases. Face Value $789.00. Collection of MUH Decimal issues from 1981 to 2005. Face Value $1,042.00. Accumulation of MUH Decimal stamps, mostly in large blocks. Face Value $566.00. Also a small selection of Pre-Decimal and a few FDC's and miscellaneous items. Accumulation of MUH Decimal issues. Face Value $355.00. Accumulation of MUH stamps and miniature sheets from 1981 to 1999. Face Value $2,184.00. Accumulation of MUH stamps in full or half sheets. Face Value $1,095.00. Accumulation of mostly early MUH Decimal issues in singles, blocks, part sheets, sheets and some booklets. Noted 1967 25¢ Christmas (140), 1968 Soil and Medical unfolded gutter blocks of 40 (5), 1968 25¢ Mexico Games (250), 1970 30¢ Cook sheet of 40, 1971 Christmas Cream paper block of 25 (3) and White paper block of 25 (4) and 1995 Peace stamp and coin pack. Some faults and blemishes. Face Value $410.00. Accumulation of MUH Decimal issues. Face Value $580.00. 1990 $20.00 Garden Painting sheet of 50 MUH. Face Value $1,000.00. Collection of MUH stamps from 1981 to 2010. Face Value $1,444.00. Accumulation of MUH Decimal issues from 1984 to 2004. Face Value $900.00. Accumulation of MUH Decimal stamps, booklets and miniature sheets. Face Value $2,016.00. Collection of MUH Decimal issues. Face Value $476.00. Complete MUH collection from 1966 to 1999 Christmas set including 1971 Christmas set of 7 singles, block of 7 and folded block of 25, excluding only the 1998 Leunig set, on Seven Seas Hingeless Album pages. Face Value $819.00. Accumulation of MUH Decimal issues. Face Value $402.00. Accumulation of MUH Decimal issues. Some MLH content. Face Value $1,346.00. Collection of MUH stamps and miniature sheets from 1981 to 2013, with some International content and a the odd duplicate. Face Value $1,996.00. Collection of MUH stamps and miniature sheets from 1981 to 2001. Face Value $785.00. Collection of MUH stamps from 1978 to 1999 in gutter blocks of 10 or 20. Face Value $2,896.00. Collection of MUH Decimal issues from 1987 to 2016. Face Value $1,914.00. Collection of MUH Decimal issues from 1971 to 2016. Face Value $2,432.00. Accumulation of MUH Decimal issues including some booklets. Face Value $1,288.00. Also 1989 Geelong Phonecard pack (2). Collection of MUH stamps from 1966 to 1999. Some earlier issues including 1971 Christmas block of 25 are MLH. Face Value $1,636.00. Accumulation of MUH Decimal issues. Some light toning blemishes. Face Value $1,039.00. Accumulation of MUH Decimal issues. Face Value $680.00. Collection of MUH Decimal issues from 1966 to 1997. Includes 1971 Christmas Cream Paper folded blocks of 25 (2). Face Value $2,230.00. Selection of MUH Decimal stamps. Face Value $168.00. Accumulation of MUH Decimal issues. Face Value $2,983.00. $1.00 Postage Stamp Combinations mostly in MUH full sheets x 1,800. (43¢ Stamps x 1,800 + 27¢ x 1,800 + 30c x 1,800). Face Value $1,800.00. Collection of MUH Decimal issues from 1979 to 1997 in gutter blocks of 20. Face Value $4,182.00. Selection of mostly MUH Decimal stamps including 1971 Christmas block of 7 (5) and block of 25 (2). Face Value $192.00. Also Cocos (Keeling) Is collection of mostly MUH stamps from 1963 to 1981, plus range of mostly Australian Decimal FDC's. Some toning blemishes. 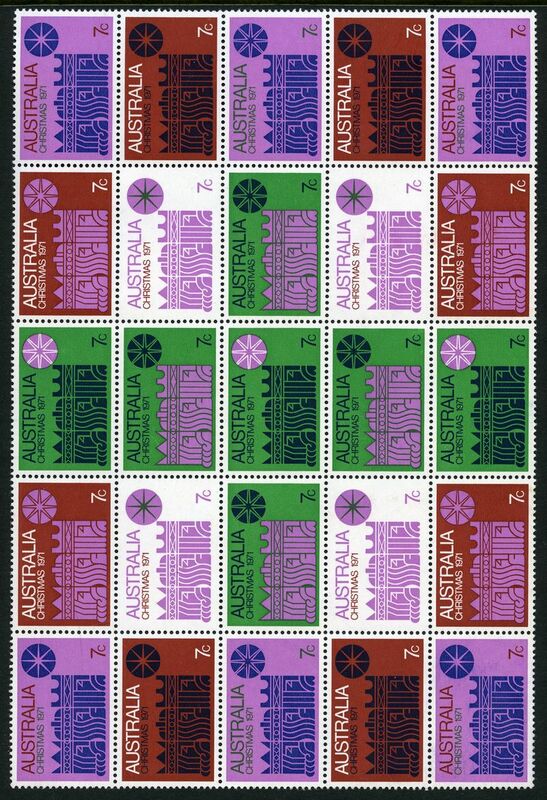 Australian Antarctic Territory, Christmas Island (Australia) and Cocos (Keeling) Island (Australia) collection of MUH stamps from 1979 to 1998, mainly in gutter blocks of 20. Face Value $1,739.00. Also small accumulation of used Australian stamps and range of covers. $1.00 Postage Stamp Combinations in MUH singles, blocks and sheets x 2,800. (55¢ Stamps x 2,800 + 45¢ x 2,800). Face Value $2,800.00. 1989 $5.00 Gardens sheets of 40 (2), 1989 $10.00 Gardens sheets of 40 (2) and 2005 Treasures from the Archives sheet of 10 (upper selvedge creased) MUH. Face Value $1,250.00. $1.00 Stamps (1,500) in MUH complete sheets. Face Value $1,500.00. Accumulation of MUH Decimal issues. Face Value $3,158.00. Accumulation of MUH Decimal issues from 1966 to 1987. Some early issues lightly hinged. Face Value $712.00. Accumulation of MUH Decimal stamps miniature sheets and booklets in singles, blocks and part sheets. Face Value $1,119.00. Collection of MUH Decimal issues from 1988 to 2013. Face Value $1,572.00. Accumulation of MUH Decimal issues. Face Value $989.00. Accumulation of MUH Decimal stamps and miniature sheets. Face Value $271.00. $1.00 Postage Stamp Combinations, mostly in MUH full sheets x 1,000. (65¢ Stamps x 1,000 + 35¢ x 1,000). Face Value $1,000.00. $1.00 Postage Stamp Combinations, mostly in MUH full sheets x 1,500. (60¢ Stamps x 1,500 + 40¢ x 1,500). Face Value $1,500.00. $2.00 Postage Stamp Combinations, in MUH full sheets x 1,300. ($1.20 Stamps x 1,300 + 80¢ x 1,300). Face Value $2,600.00. $1.00 Postage Stamp Combinations in MUH singles, blocks and sheets x 1,600. (37¢ Stamps x 1,600 + 36¢ x 1,600 + 27c x 1,600). Face Value $1,600.00. Accumulation of MUH Decimal stamps and miniatures sheets in singles, strips and blocks. Face value $1,633.00. Also 1982 Blue Postcard and 1984 Brown Postcard packs. Accumulation of MUH Decimal stamps and miniature sheets in singles, blocks and sheets. Face Value $1,707.00. 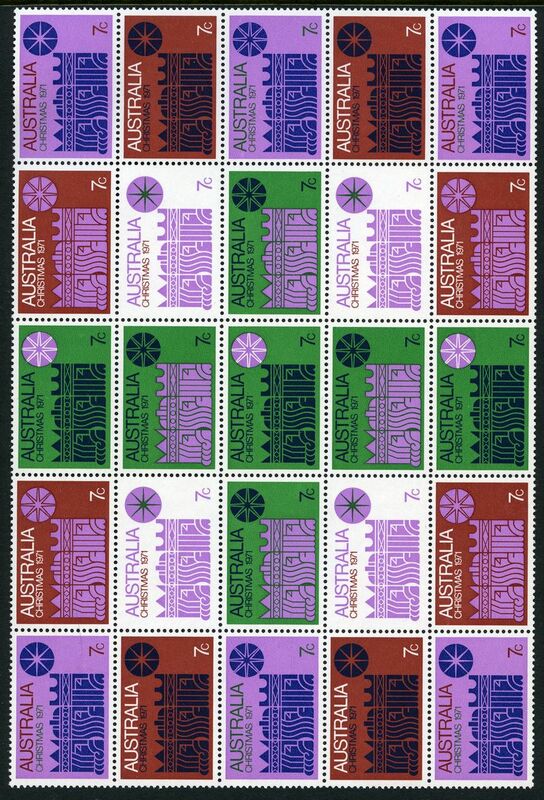 Accumulation of MUH Decimal stamps including some Christmas Island Australia issues. Face Value $2,532.00. $1.00 Postage in Three or Four Stamp Combinations x 768. Face Value $768.00. Accumulation of MUH stamps from 1966 to 1998, including booklet, coil, se-tenant pairs and strips, plus 226 miniature sheets. Some lightly hinged content and varying duplication. Face Value $1,068.00. Accumulation of 143 booklets from 1967 to 1996, plus 1999 45¢ Coastal Flowers box of 100 (7). Face Value $728.00. Collection of MUH Decimal issues from 1966 to 1988 including some AAT in Seven Seas Hingeless album. Face Value $224.00. Collection of MUH Decimal issues from 1966 to 1985 in KABE Hingeless album with slipcase. Noted 1971 Christmas Cream and White paper unfolded blocks of 25. Face Value $200.00. 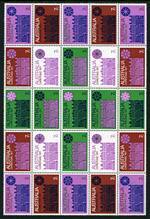 $1.00 Postage Stamp Combinations in MUH singles, blocks, booklets and sheets x 1,650. (50¢ Stamps x 3,300). Face Value $1,650.00. Accumulation of MUH Decimal stamps, miniature sheets and booklets. Face Value $2,741.00. Collection of MUH Decimal issues from 1981 to 2001. Face Value $1,030.00. Accumulation of stamps on piece, mint without gum, with values from 5¢ to $5.00, including 45¢ x 105, 50¢ x 165, 55¢ x 123, 60¢ x 348 and 70¢ x 340. Face Value $794.00.